This project was inspired by the dance figures of 'Sema' created by Mevlana Celaleddin-i Rumi, a philosopher who lived during 1207 - 1273 in Anatolia. This project also reflects Turkish customs, history, beliefs and culture. Sema represents unity, true understanding of yourself and others, and respect and harmony. Mevlana believed that if you understand yourself you will be able to understand everything and even the universe. Spinning Circles (Hula-Hoops) uses motion sensors to trigger an algorithm that I coded in the object oriented programming language called Processing. 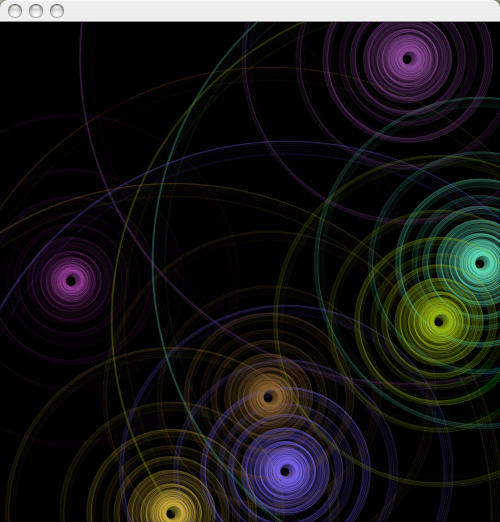 The algorithm develops spinning circles in random RGB values in black background on the screen. Each circle represents an individual who is in exploration of love through self-discovery. Sound is also used to represent and react to the motion of the spinning circles. Live audio input changes attributes of the circles by pushing them apart from each other to simulate physical distraction in the outside world. The experience is an interactive performance piece that simulates meditation. I created this interactive performance piece at Interactive Technologies Program of NYU Tisch School of Arts.